I really could not decide on the better post title to aptly describe the blogger dinner I went to Saturday night, so I used them both, probably creating the world's longest blog post title! Considering this is going to be a long post, it kind of makes sense. This week I have been teaching Vacation Bible School, something I am grateful to have the opportunity to do. I want to be sure the kids have fun while learning the Bible stories. but the real challenge is determining how lenient to be and how many feelings I should try to spare. No, I don't mean I need to go somewhere with the hubby. We did that not too long ago, remember? And the kid will be at grandma's again in another week, so we should get to go on another mini-date. Mini because my husband will be on call, which he is six months out of the year. And that means he cannot go far from home in case he gets a call and particularly if he has to go somewhere. Which brings me to why I need a date. Next weekend I will be meeting up with some fellow bloggers, none of whom I have met in real life and at least half of whom have blogs I have never read, for dinner. I was planning to take Jordan since a couple of the bloggers are bringing their kids. Then hubby informed me a few days ago that he looked at our calendar and saw that I had a blogger dinner, so he figured that would be a good time to send the kid to grandma's. 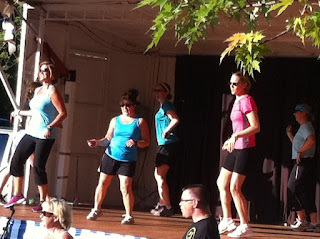 Last night my fellow Zumba-doers and I did a demo at our church festival. Well, I guess mini-class is a better description; we danced for about 30 minutes, doing something like eight songs. I had misgivings about "performing" in front of everyone. I am not the most graceful person. Actually, I am not even remotely graceful, and I am fairly uncoordinated. And the last time I did anything close to dancing on a stage was for a dance recital back when I was about 10 or 11. When you are a kid, adults will generally oh and ah at you, or at least smile or giggle at the silly moves you make. But at 40, doing the wrong step, being off beat, or tripping, as I have been known to do once or 100,000 times in my life, you will pretty much just be embarrassing yourself. What do you consider a vacation? Does your trip need to be a certain number of hours or miles away? Do you need to be gone for at least three or four days for it "to count"? Or as long as you are off work or school for more than two days, is that enough of a vacation? I was a pretty spoiled child. We went to the beach for a week pretty much every year in addition to going to another place or two for a day or more. When I was in high school, my family had a house in Ocean City, Maryland, which meant several weeks at the beach. And for about a year, my family also had a house on Indian Lake (near where Flight 93 crashed), so we had many weekend getaways there as well.Yep, rough life I had. I have "written" versions of this post in my head many times. In fact, if I went back and looked, I would probably discover most of it in an older post. But since I don't feel like trying to figure that out and because this is what I am thinking about now, I am just going to put it out there now. Not well written, but, to quote one of my favorite sayings, it is what it is. I cannot seem to go more than a few days without lamenting that I have only one child. This was a mostly intentional decision, mind you. Brian and I had said we would have another child once we sold our house and moved into another. But we tried the house selling in 2007 and 2008, and got nowhere. By the fall of 2008, I really did not want another child, so I gave up that thought. I still don't want another child. Really. It's funny (and not funny, ha ha) how when you have a baby, you think that it cannot possibly get any harder than this, with the lack of sleeping and the constant worry about almost everything. But as your kids grow up, you realize just how easy you had it back in the day. This morning, I read an article about a mother who choked the boy who was bullying her daughter. Before I even read past the headline, I found myself almost siding with the mom. I would never do anything like that; after all, I am the one, unlike hubby, who tells my kid to turn the other cheek. But I can see how as a parent you could become so frustrated, worried, angry, etc., that you could be pushed to that point. In this morning's paper, I read a snippet about a 19-year-old woman (I call that a girl, much as I referred to the 25ish-year-old kid I worked with as a kid) who left her five-week-old baby on the roof of her car. Most of us, including me, have left a coffee cup or other small item on our car roof at least once in our lifetime. But a baby strapped to an infant seat? It is bad enough to put your kid on top of the car to begin with (I think I would have had trouble lifting my kid in her infant seat that high), but to leave the baby there, drive away, and not realize it? Wow.